These personalized hardwood dog and cat photo frames are a wonderful way to display that favorite photo of your cherished pet. 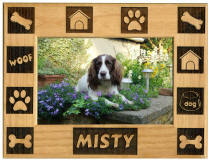 These laser etched personalized pet frames are very beautiful. They come in 3 sizes 4x6, 5x7, 8x10 and can be personalized for either portrait or landscaped photos. Suffering the loss of your beloved pet is never easy. 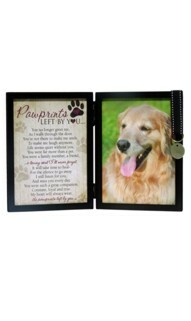 This Pawprint frame provides comfort with a poem of encouragement on one side and a place to keep a 5x7 photo of your pet. We personalize on the circle plate with the pets name and date. Making the decision to put your beloved pet to sleep is never easy. Find comfort in the life long keepsake photo frame. We personalize with the pets name and dates on the front of the circle plate. 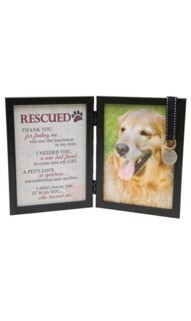 Celebrate your new pet with this personalized rescued pet frame, a keepsake you're surely cherish lifelong. We can personalize on the front of the plate with the pets name and date, you'll find a small pawprint stamped on the back. This personalized dog laser etched wood photo frame features various dog motifs around the frame with your dog's name laser etched across the bottom. This wood dog photo frame is available in 3 sizes: 4x6, 5x7 and 8 x 10. Unique and personalized, this dog frame is the perfect way to display a picture of your favorite pet, whether he's a rescue pup or a pedigree pooch. This personalized cat laser etched hardwood photo frame features various cat motifs around the frame with kitty's name laser etched across the bottom. 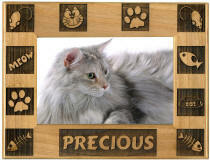 This hardwood cat photo frame is available in 3 sizes, 4x6, 5x7 and 8 x 10 sizes. We love our dogs What better place for a picture of your 4 legged family member than in this beautiful frame. The satin finish of the frame is accented with shiny paw prints. Engraving on this frame will also be shiny, to complement the paws. This frame holds a 4x6 photo and can be horizontally or vertically displayed. 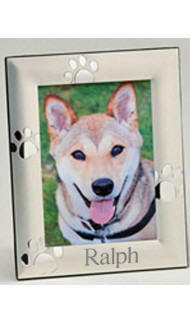 Adorable dog bone frame with plenty of room to engrave a special message about your dog. Frame holds a 3 1/2 in x 2 1/2 in picture. Celebrate the milestone's in your dog's life. 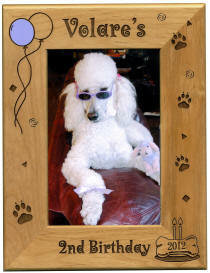 Your dog's first birthday and beyond can be remembered with a personalized dog birthday frame. We personalize this dog birthday frame with your dog's name, the birthdate, and the correct number of candles on the cake. Available in three popular sizes, and can be purchased with the engraving either horizontally or vertically. This dog birthday frame has an easel back for table top display.